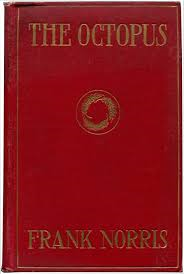 The Octopus: A Story of California is a 1901 novel by Frank Norris and was the first part of an uncompleted trilogy, The Epic of the Wheat. It describes the wheat industry in California, and the conflicts between wheat growers and a railway company. Norris was inspired to write the novel by the Mussel Slough Tragedy involving the Central Pacific Railroad. In the novel he depicts the tensions between the railroad, the ranchers and the ranchers' League. The book emphasized the control of "forces"—such as the power of railroad monopolies—over individuals. Some editions of the work give the subtitle as alternatively, A California Story. Following the release and subsequent success of Norris' 1899 McTeague, Norris began searching for an idea for his next project. Within a few weeks he had formulated his idea for a trilogy of novels on the topic of wheat, his 'Epic of the Wheat', from its growth in California (which would be the basis of The Octopus), to its distribution in Chicago (The Pit, published posthumously in 1903), to its consumption in a famished region of Europe or Asia (intended to be titled The Wolf, although never begun before his death). The Octopus itself was based on the Mussel Slough Tragedy of 1880, which involved a bloody conflict between ranchers and law agents defending the Southern Pacific Railroad. The central issue was over the ownership of the ranches, which the farmers had leased from the railroad nearly ten years earlier with intentions of eventually purchasing the land. Although originally priced at $2.50 to $5 per acre, the railroad eventually opened the land for sale at prices adjusted for land improvements, leading to the conflict depicted in the book. Norris decided upon the project in March 1899, and by early April had left for California to research the project. Over the following months he visited the locations of the incident and worked on nearby farms, gaining firsthand knowledge of the wheat farmer’s life. He returned to New York that fall, and between January and December 1900 wrote the manuscript for The Octopus, which was published the following April with substantial success. G. Frederick Keller's "The Curse of California", which appeared in The Wasp on August 19, 1882, is the likely origin of the depiction of the Southern Pacific Railroad monopoly as an octopus. The Octopus depicts the conflict between wheat farmers in the San Joaquin Valley and the Pacific and Southwestern railroad (P&SW). The railroad attempts to take possession of the land the farmers have been improving for many years, forcing them to defend themselves. The wheat farmers are represented by Magnus Derrick, the reluctant leader of the ad hoc farmers' League designed to fight for retention of their land and low-cost freight rates. S. Behrman serves as the local representative of P. & S. W. In his attempt at writing his great epic poem, Presley witnesses the disintegration of Annixter, Derrick, Hooven, and their families. Presley – A poet searching for a plot, as well as a surveyor of the dilemma between the ranchers and the railroad. The novel begins with him, riding his bicycle across the countryside, and ends with him as well. He lives on Los Muertos with the Derricks as a friend of the family. The character appears to parallel the author, with Presley’s search for a 'Song of the West' being comparable to Norris' 'Epic of the Wheat'. Presley later discards his grand ideas and publishes 'The Toilers', a poem about the farmer’s plight which stirs up public interest in the issue. Magnus Derrick – Owner of El Rancho de los Muertos and the father of Harran and Lyman Derrick, Magnus represents the upstanding integrity of the previous generations, as opposed to the modern, increasingly dishonest dealings of the youth, as represented by the railroad and the rancher’s League, which Magnus leads. Harran Derrick – Son of Magnus, Harran aids his father on the ranch. It is Harran who persuades Magnus to head the League. Along with his father he is part of the inner circle of the ranchers' League. Lyman Derrick – Son of Magnus, Lyman is a lawyer in San Francisco up north. Lyman is contracted by the League to represent the farmers on the state Railroad Commission, which decides on transport rates. Annixter – Owner and operator of the Quien Sabe Rancho, Annixter is a young, headstrong confirmed bachelor who, over the course of the novel, matures into a soft-hearted, selfless man, largely due to his developing interest in Hilma Tree. Part of the inner circle of the League. Vanamee – Long-time friend of Presley, Vanamee is a wanderer haunted by the tragic, violent death of a love interest, Angele Varian, years before. In the novel he works on different ranches and spends a great deal of time at the Mission San Juan de Guadalajara, where Angele had been murdered. The novel compares Vanamee to biblical prophets, as he has a strong spiritual aspect. S. Behrman – In addition to being a banker, real estate agent, and a political boss, S. Behrman is vilified by his representation of the railroad. As such, he is despised by the ranchers. Other important characters include: Hilma Tree, Hooven, Broderson, Osterman, Dyke, Cedarquist, Delaney, Annie Derrick, and Father Sarria. "The Octopus" is a novel of crude and almost barbaric force; showing in many parts the deep impress of Zola both in method and manner, but disclosing also great vigour of imagination, dramatic feeling and a deep sense of reality. 'The Octopus' is a powerfully visualized picture of the evils wrought by monopolies or "trusts." In this case the monopoly is a railway, its prey the wheat-growers and other producers in California. ... If it be true that it is not wisely described as an epic, it is equally true that it is a powerful and tragic piece of fiction. In the novel, the octopus is symbolic of the railroad monopoly. Even today, the image of an octopus is often used to describe large monopolies such as Microsoft, Google, Facebook, and Amazon. The novel points to shifting perceptions of scale in our time, portraying a system of power to which humans become increasingly indifferent as corporations focus more on their own profit than on the individual. Where consumption and productivity become the main goal of the companies, individual lives become meaningless. ^ Starr, Kevin. (1986). Introduction. The Octopus. New York: Viking Penguin, Inc.
^ Brown, Richard Maxwell (1991). No Duty to Retreat: Violence and Values in American History and Society. Oxford University Press. p. 219. ISBN 0-19-504510-6. ^ "American Literature". The Saturday Review of Politics, Literature, Science and Art. 92 (2392): 280. 31 August 1901. ^ "The Octopus. By Frank Norris". The Athenæum (No. 3858): 447–448. 5 October 1901. Altenbernd, August Lynn (1949). The Intellectual Currents in The Octopus: A Study of the Naturalism of Frank Norris. (M.A. Thesis) Ohio State University. Berte, Leigh Ann Litwiller (2005). "Mapping The Octopus: Frank Norris' Naturalist Geography," American Literary Realism, Vol. XXXVII, No. 3, pp. 202–224. Eby, Clare Virginia (1994). "The Octopus: Big Business as Art," American Literary Realism, Vol. 26, No. 3, pp. 33–51. Frye, Steven (2007). "Presley's Pretense: Irony and Epic Convention in Frank Norris' The Octopus," American Literary Realism, Vol. 39, No. 3, pp. 213–221. Houston, Margaret Dorothy (1939). Frank Norris's Theory of Romanticism and Its Application in The Octopus. (M.A. Thesis) University of Washington. Lundy, Robert Donald (1956). The Making of McTeague and The Octopus. (Ph.D. Diss. ), University of California, Berkeley. Lye, Coleen (2003). "American Naturalism and Asiatic Racial Form: Frank Norris's The Octopus and Moran of the 'Lady Letty'," Representations, Vol. 84, No. 1, pp. 73–99. Meyer, George Wilbur (1943). "A New Interpretation of The Octopus," College English, Vol. IV, pp. 351–359. Pizer, Donald (1962). "The Concept of Nature in Frank Norris' The Octopus," American Quarterly, Vol. XIV, No. 1, pp. 73–80. "Zola in San Francisco", by Victor Davis Hansen in The New York Times Book Review, January 1, 2006. 3 short radio episodes "Bestial Welter[permanent dead link]", "Nourisher of Nations[permanent dead link]" and "The Octopus[permanent dead link]" from The Octopus by Frank Norris. California Legacy Project. This page was last edited on 7 March 2019, at 15:40 (UTC).